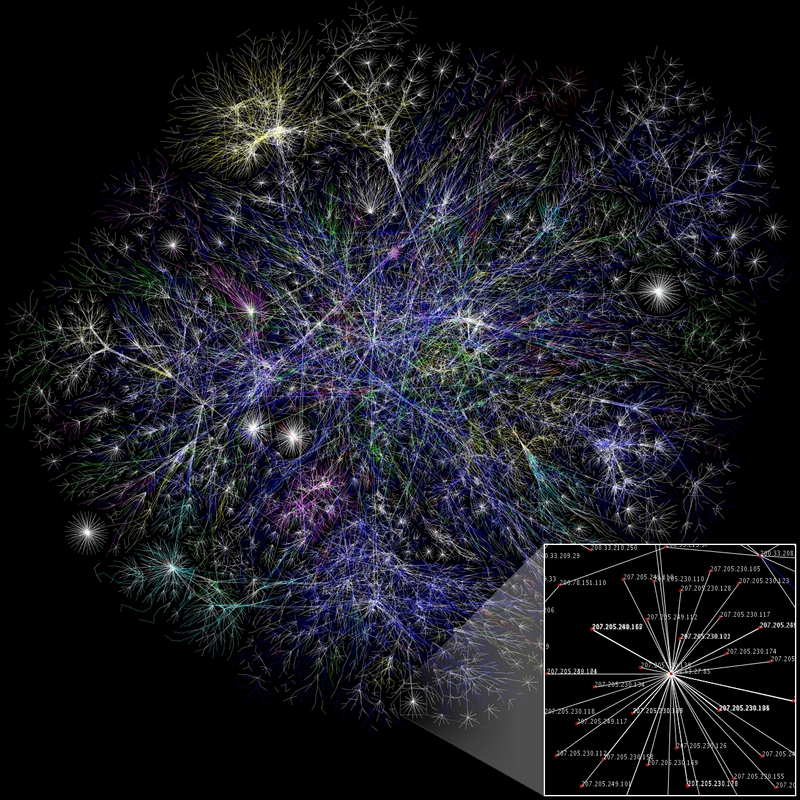 Internet Maps for Geeks Only? If we’ve only started to map these new ecosystems, their transposition to a rehabilitated fictional cartography offers a start. Can one imagine the map presenting us with an indicating arrow, “You Are Here”? The lack of orientation it offers makes it perversely comic. 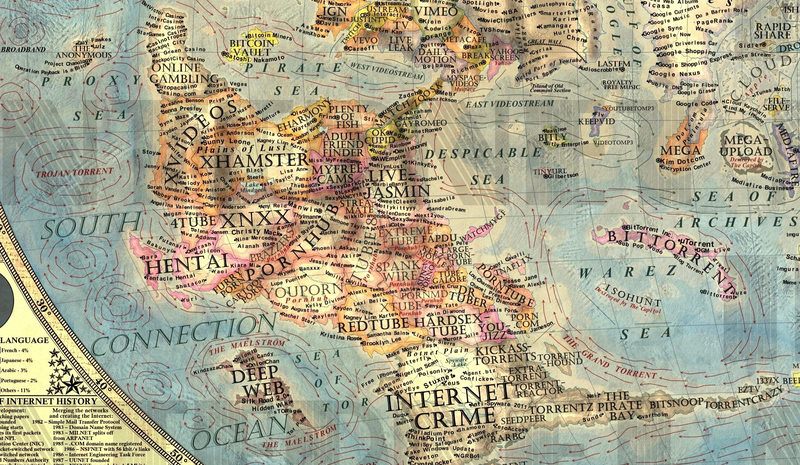 This is, perhaps, why it is pleasantly reassuring to see the ultra-detailed old-school “Map of the Internet,” compiled so painstakingly after a Rand McNally five-color atlas by the amateur Slovakian cartographer and graphic designer Martin Vargic. Consciously modeled by Vargic to echo the familiar patient didacticism of the maps long included in National Geographic, whose conventions and symbolism have been so aptly interpreted by Denis Wood and John Fels, the “Map of the Internet 1.0” came out from xkcd this fall of the internet with limited fanfare; Vargic takes the notion of a “data-stream” to its geographic analogue of aquatic spaces, where Data Streams feed Data Oceans, Information Oceans, and Spam Oceans that swirl around inhabited or colonized continents of servers, replete with a comprehensive detail that perhaps predominantly appeals to geeks alone, were it not for the comically retro reserve of its staid 2-D conventions, overloaded with densely positioned text in the manner of a National Geographic map. 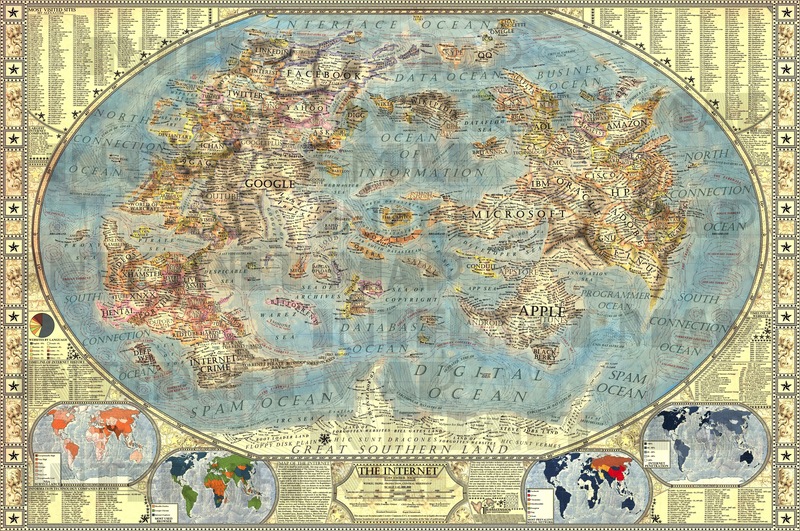 With a toponymic density so perfected in the medium of the old National Geographic paper fold-out maps that it is hard to read or replicate on the small screen, the map is both a romantic look back at the conventions of mapping the boundaries of sovereign territories in a globalized world and a projection of a world that has come to colonize our minds. (If it might truly be suitable for classroom use–if for what sort of kids it’s hard to imagine.) But the map is also for us: for much in the way that early world maps engraved and designed by the cartographer Abraham Ortelius offered their readers meditative ends in the sixteenth century, bedecked with stoic maxims, we can gain some stoic remove from the web in this culturally reassuring map, the density of whose textual content calls for the sort of close-reading close to the pure pleasure of map-reading. 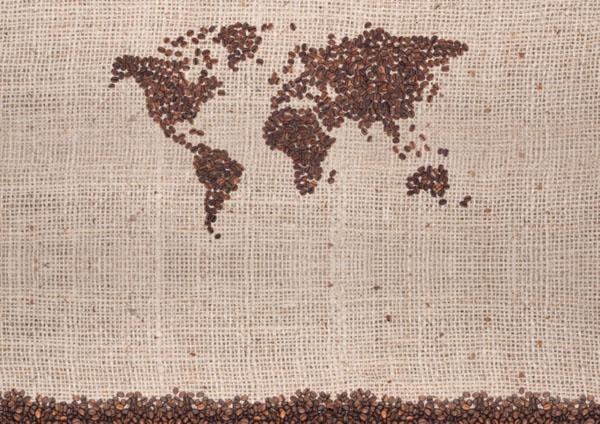 As we explore this map, we exult in its copious detail, encoded, to be sure, in the format of a geographic map, but coming perilously close to a childhood pleasure of a land of imagined travel. Exploring the detail of multiple fonts that alternates boldface, italics, and capital letters, we can navigate the near proximity of Database Ocean to the shoals of the Sea of Copyright, crossing the land of Flickr to the Sea of Archives where we find our Mega Uploads, viewing the oceanic currents that might carry our craft to different regions, or veer off from the Sea of Copyright to the smaller, protected gulf of the App Sea monitored by the App Store on Apple. Or, if we’re not so versed in currents of code, or the unpredictable currents of the Circumpolar Datastream, doing our best to avoid the perils of the Zuckerberg Gulf or the remote island of Second Life, we can find ourselves in familiar territories below the Interface Sea, or in the lands of LinkedIn, Facebook, Twitter, Yahoo, Pinterest, and Reddit, remotely adjacent to Wikia, on the one hand, and, on the other, the Sea of Art–and World of Warcraft–which we might be far more ready and prepared to navigate and explore, without descending south to Google. 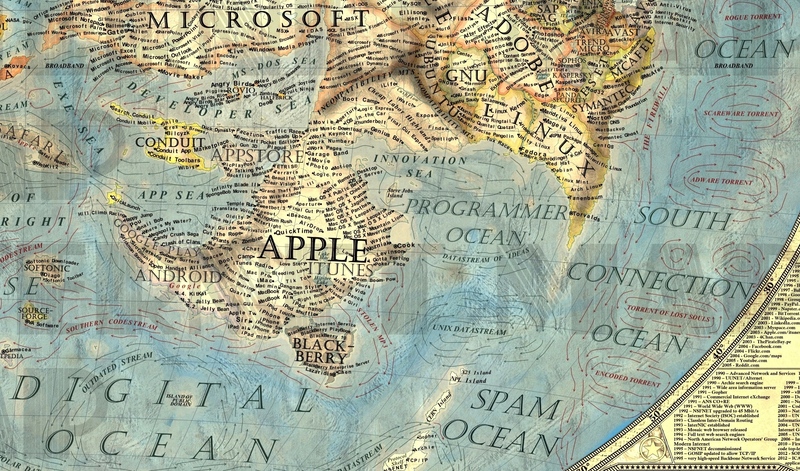 Off of the Ocean of Information lies an opportunity of repose for the buffeted traveller, below the looming megastate of Microsoft, and beside the Programmer Ocean, safely out of reach of the domain of Spam, nourished by the warmer Datastream of Ideas that washes its coasts, where iTunes is established and Android can be accommodated, and even Blackberry constitutes an offshore isle. In this land, Innovation Sea is a fertile breeding ground of speciation, itself nourished by the whirls of the Datastream of Ideas. The loving rendering of the internet as a patiently designed map of a world we are probably too familiar inhabitants comically lavishes graphic attention on virtual media of communication which pride themselves on being paperless: the map employs or revives a familiar artifice of mapping as if to render transparent the dramatic expansion and proliferation of a diversity of radically disembodied forms of reading online by highly conventional signs and forms of design, as if we could readily see the webs of information, servers, platforms, and providers that might more aptly be figured as a sea. The familiar poetics of cartographical space Vargic so ably encoded seems meant to offer, of course, an opportunity for repose as this is a recognizably domesticated terrain, as much as a terrifying Digital Ocean, whose eddies of Outdated Datastreams buffet the traveler, and where Encoded Torrents terrify the mariner who ventures to far offshore. There is the scary less-known regions that correspond to the poles, and echo early modern maps in their reference to terra incognita (Hic Sunt Dracones–a legend that rarely appears on an actual map, and never appeared in the medieval maps), below the Digital Ocean–if not exactly remote, the Great Southern Land is the somewhat terrifying terrain of Floppy Disk Plain and Steve Jobs land. 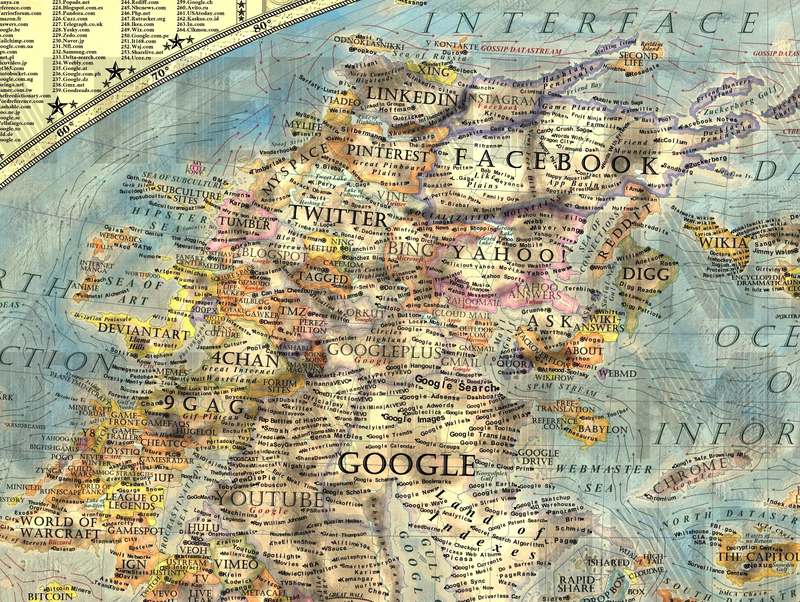 (The But the copious abundance of written meaning that lies across the map offers a return to the pleasures of map-reading in an age of Google Earth. 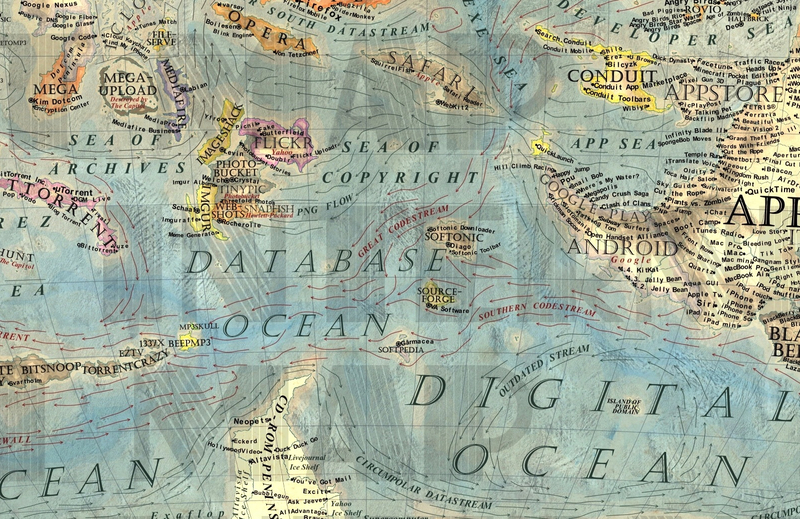 The not-so-subtle beauty of Vargic’s map is that it uses familiar conventions as a way to distance ourselves from the world of data overflow, the information overflows of the Ocean at its center, whose azure waters lap the land of Google but maintain their autonomy from it, at the same time. And those huge internet companies–Cisco, HP, Oracle, IBM, Microsoft–are comfortable or credible regions on the map, where we might just decide not to go. 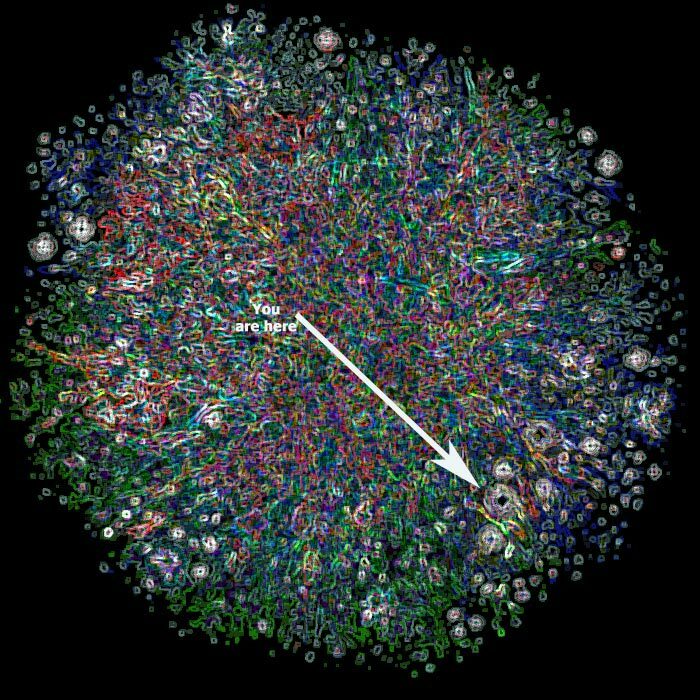 It’s not only for internet geeks, but is something of a stable refuge, on a virtual piece of paper, from the heterotopia of the portal.